Right now it doesn’t look like it. I’ve offered it to the same people who produced the other two and they are waiting to see how it performs before moving forward. I’ll be sure to post if anything changes. Well I bought it on kindle. I hope the audiobook comes I travel a lot and I lived the other two. Love your work! I’m a great fan of audiobooks myself. I’ve got a half hour commute twice a day, not too bad, and a good audiobook makes it more interesting. 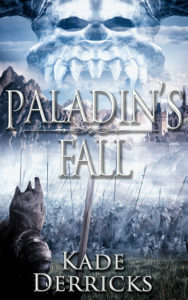 I liked all your books, just finished Paladin’s fall. After I bought it on Kindle I couldn’t let it until I finished it. Thanks for your kind words and the review you left. I’m glad you enjoyed them. I really enjoyed all three books. You caught my interest when I saw you live in Empire, NV, I live in Silverpeak, NV, down by Tonopah. I will be impatiently waiting for the next book. Great work on the three. Hope you had Happy Holidays. Happy New Year. Good to hear from you Sylvia. We lived in Empire for five years and left a little over a year before they closed the drywall plant in 2011. I keep the Empire address on things since it’s a bit unique. They discontinued the zip code. I’ve been through Tonopah and Goldfield a half-dozen times but never Silverpeak. I find there are a lot of interesting places in the west. Most have a unique history behind them. QUESTION. Do you plan to write a third book where Dain’s parents and siblings REUNITE with Dain? Good question. Originally I planned a five or six book series but now it’s looking like three and three. Still six books only broken into two groups. None of these are planned to bring Dain back to his family. This doesn’t mean we won’t see them again though. 1. What does the birth of a kingdom look like? 2. What would a man have to do in order to leave a lasting legacy for his family? What would a dishonored family have to do make amends? Dain’s family might help answer that. Please continue to write, because I believe you are truly gifted. And, if by some chance in the near future you wish to write about a Mage, I won’t be too disappointed. I haven’t gotten too far into book 3 yet. Just floating a few ideas around but I see quite a bit of Luren in there and I suspect she’ll fit your bill for some magecraft. Will Luren Create Teleport Spell? form, in other words HARDBACK or PAPERBACK? Any idea when you’ll finish writing and release book 3? I have to admit to getting slightly IMPATIENT. QUESTION??? DID KADE DERRICKS DIE? Just Wondering. No, but I have been quite busy. Dain and I needed a break from each other so I’ve been working on a new series. Book 1 Sons of Plague should be published by the time you read this.